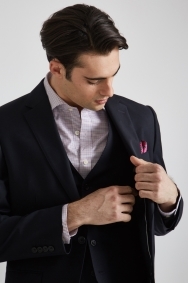 Looking for a contemporary suit that will keep on performing from dawn to dusk? You've just found it. 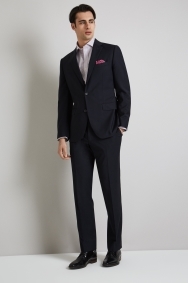 This outstanding offering from Moss 1851 is the iron man of the suit world. 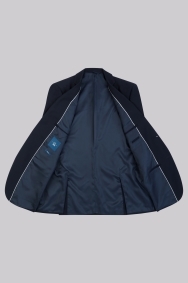 As a tailored fit performance jacket its fabric has stain and water repellent properties. What's more, thanks to the addition of Lycra it won't crease up too much during the day, leaving you to stroll from the boardroom to the bar looking as sharp as ever. Pair with a Moss 1851 tie and one of our slim fit shirts to create a sophisticated outfit that won't let you down. Good value as bought in sale. Received my suit on time as expected. Extremely satisfied with the quality and fitting of the suit. Will definitely purchase again in the future. Looks well not worn it yet. Happy with the purchase - jacket for casual purposes. Lovely suit, although not 100% sure about the material, hence only 4*. My husband is really happy with the fit..he's not too tall and the short length is perfect..he's especially pleased with the fit of the jacket. great fit, classic style. my son got the job. Just what I needed. Fits perfectly. Great fit and looks good! was expecting the quality of the jacket to be better, in comparison to some of my other suit jackets. the material feels rough in comparison. Good quality suit at a good price. High quality material, exquisite sewing. Again,it fits and looks well. Very comfortable and look good on. Same as the strides - nice fit! Lovely colour and fit, top jacket for price. Jacket seems to be poor quality as I had to return it to the store because of a white stitching in the jacket. Shoulders appear out of shape, particularly the left side. An excellent all the way round Andy a lovely colour! The suit fits perfectly as i knew my size as bought from Moss Bros before. 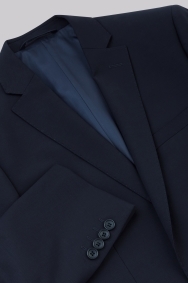 Great quality suit. Nice cloth, stitching and a good fit. I like it and would recommande it to my colleagues and family. Good quality and fit for the price - very pleased with it. Perfect fit and cut. Excellent quality. Nice looking jacket , my 38 medium/regular is a great fit. Professional and friendly without being imposing. Very helpful and proffessional, excellent advice given. Unrushed and pleasant to deal with. Service I received was excellent. Very quick suit purchase because the sales assistant was very knowledgeable and considering the wedding I was attending was 3 hours later I walked out of the shop with the perfect outfit. Paul was excellent knew exactly what would suit my husband. 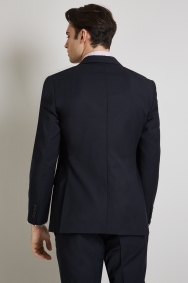 Lovely dark navy suit jacket that would suit (pardon the pun!) all occasions. The tailored cut adds that touch of class. It looks more expensive than it actually is! fantastic fit, good quality perfect colour. The quality of the products are nice. The lady who served me couldn't have been more helpful rf friendly, she was superb. 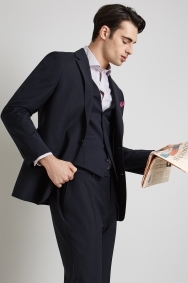 Good value suit jacket - fit very well.